I don’t know about you but when our family gets together we always have a big meal, especially when it’s to celebrate a special holiday like Easter! Here’s my delicious family celebration menu. Our traditional Easter lunch is centered around my famous brisket, a twice baked potato casserole, yummy green bean casserole and Sister Schubert’s Rolls (almost as good as mom’s). I don’t know what the Sister does, but her rolls are just so amazing! Here’s my famous brisket recipe! The recipe is so simple, people don’t believe me when I share it with them, but take my word for it, it is! This delicious brisket recipe is just like our Christmas decorating recipes; easy & quick and you can do it! Spray pan with Pam before placing trimmed brisket, fat side up in the pan. I like to use disposable baking pans for easy cleanup! Pour 1/4 cup of water and 1/2 bottle of liquid Smoke (my favorite Firago) over brisket, and sprinkle with Wyler’s Beef granules to coat the top. And that’s it! No need to add ANYTHING else, trust me! Cover brisket with heavy duty aluminum foil (Reynolds) and seal tightly. Place in a pre-heated 250-300 degree oven on middle shelf. Cook for 8-9 hours, depending on your size of brisket. After cooking, remove brisket from oven being careful not to slosh the liquid. Carefully open foil to release steam and heat, then allow brisket to rest, loosely covered. Next, remove the top layer of fat and discard, place the brisket on a cutting board and use an electric knife for perfect slices! Pour off 1/2 of the liquid and discard. Return sliced brisket back into pan (or fancy serving dish) and top off with your favorite bottled BBQ sauce. Cover with foil until ready to eat. You may want to reheat slightly. Did you notice my Lisa Frost cutting board? Show Me Decorating Tip: Plan a make ahead menu for large family gatherings. This brisket recipe is great prepared the day before and cooked overnight. Most vegetable casseroles can be made the day before and refrigerated until ready to heat and serve. Ask family members to bring a salad and desserts! We finish off with an Easter egg hunt and fun desserts! We love to celebrate Easter with the eggs, candy, rabbits and new clothes, but the real celebration is life. Life given to us because Christ is Alive!! Thank you to AKA Design + Life for this beautiful printable! Show Me a Couples Shower…..Bring a Blender for her, Some tools for him, or pick out a present for the two of them! 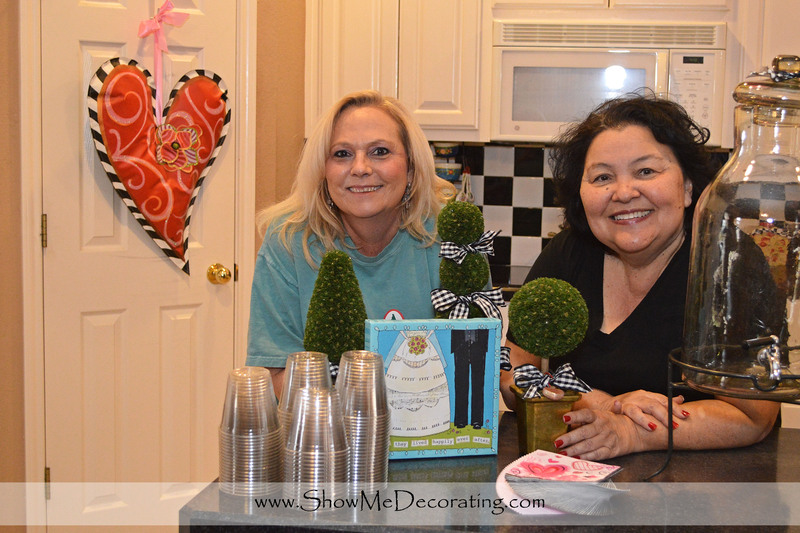 How do you decorate and celebrate a couples shower in February….. with love that is! Considering that the month of Love is February, what better time to host a couples shower when your house is decorated for Valentines! As proper etiquette would have it, a shower is hosted after a wedding where everyone is not invited to the wedding……so the good friends of the mother and father of the groom hosted a couples shower. What better time than a noon Sandwich, chips and dip bar! And where do we start? With a theme and color story! Theme: Couples shower & wedding celebration. Color story: Red, pink and black and white! Hearts and Love! Alta Lynn shows off the tablescape. A black table-cloth serves as a great backdrop with the punch of the hot pink paper mesh runner! Black table-cloth with pink paper mesh runner. Show Me Tip: Invest in good quality fabric tablecloths. To create an inexpensive table runner use a length of mesh, the ends gathered with a rubber band and trimmed in coordinating ribbon. In this scene black and white polka dot ribbon is perfect! Coton Color’s Happy Everything platter with seasonal attachments serves as part of the centerpiece and gift! Flowers and Coton Colors platter are elevated on a Pink cake stand. Creating different heights adds interest to your tablescape. Show Me Tip: Gather up your serving pieces and set your table the day before the shower. Mark each platter or stand with a sticky note of which food goes where. Black and white serving pieces are collected and used to support the color story. Setting the table, and a beautiful chandelier. Baked Hawaiian sandwiches were the star of the show. They are delicious and easy to make ahead. You may adapt to your taste and likes. A vegetable tray, fresh fruit, and a selection of chips and dips completed the savory menu. Hearty enough for men! A delicious selection of cupcakes, cookies and bars finished the party on a sweet note! Sharing the decorating responsibilities helps to create a beautiful event! Ice tea bar and light fruit punch quenched everyone’s thirst! Guest are greeted with a beautiful wreath,Lisa Frost Heart banner, red, pink and black and white! 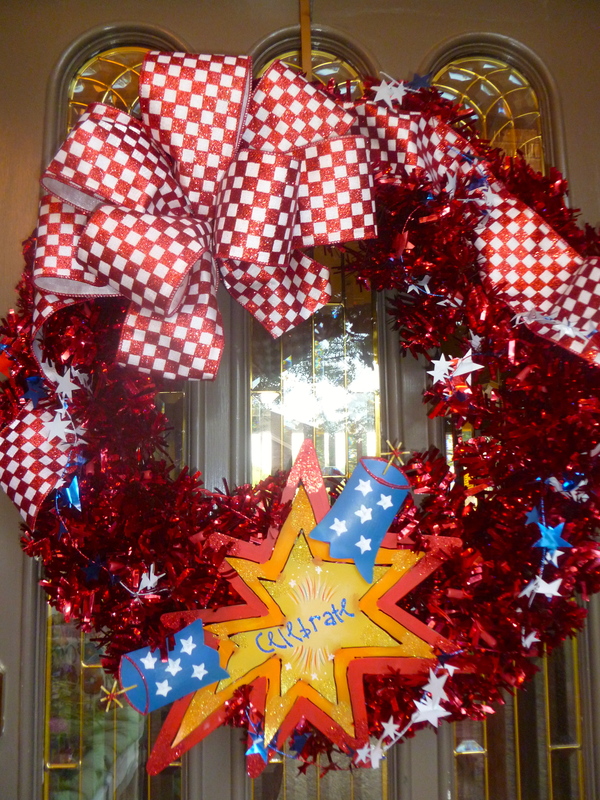 Show Me Tip: Create a great 1st impression and set the theme for the celebration or event stating at your front door. Live, love and laugh…Show Me a Happy Couple! For more great ideas, follow us on Pinterest or download the Show Me Decorating app. 1st Impression, you only get one chance! Show Me a Grand 1st Impression! Show Me a Grand 1st Impression, with a touch of turquoise. Welcome, welcome, welcome with a fresh touch of turquoise. 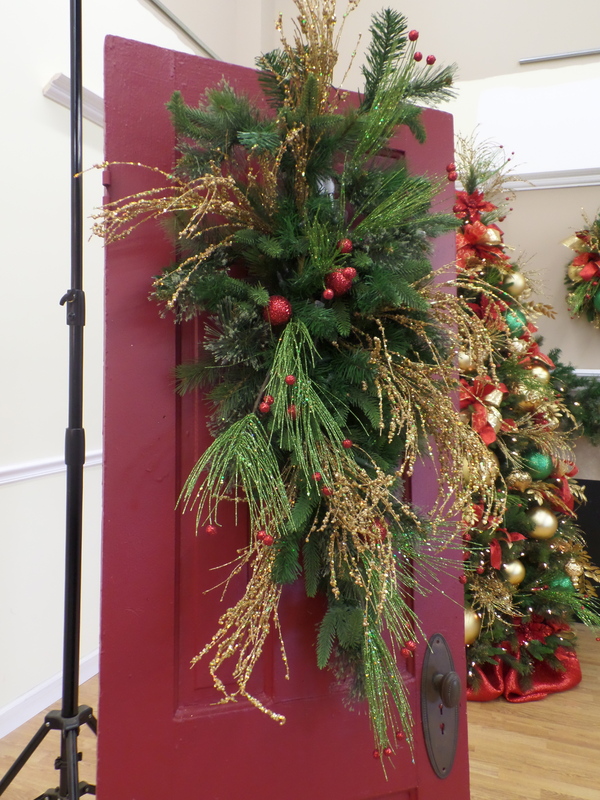 This door boasts a split wreath so you can open the door and the other half of the wreath stays in place. TIP: With a large two door entryway this is the perfect solution! The impressive doorway is surrounded by garlands filled with balls, florals and ribbon to match the wreath. The Show Me Decorating decorates on site. Tip: mortar screws are inserted in mortar around the doorway and left in for year round use. Garland is secured to the screws with floral wire, wrapped around head of screw and then wrapped around the garland main wire. Next the 3 key Show Me Decorating ingredients are wired on, ribbon, balls and fill in with florals. 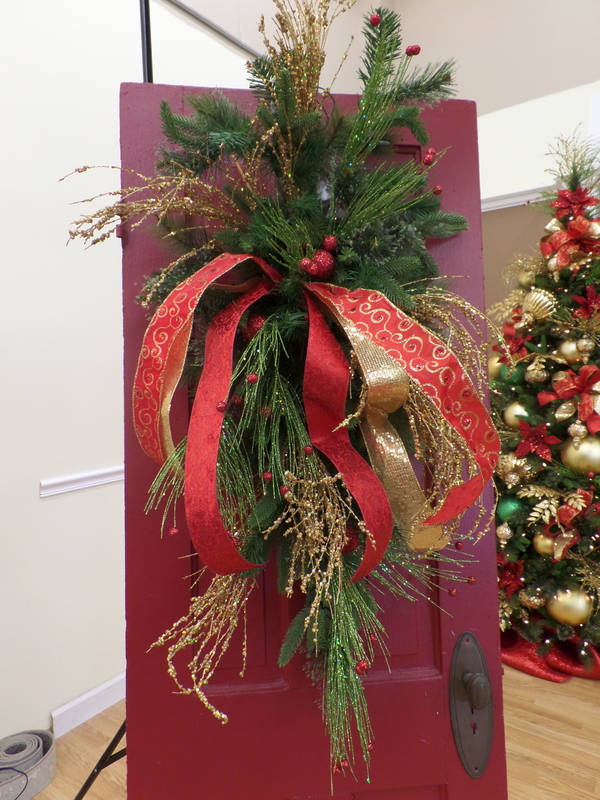 Does your door make a great 1st impression for the holidays? Show Me Decorating shows you how in a few simple steps! Pick your base: wreath, teardrop, ball wreath, grapevine etc. Keep in mind the size of your door, porch or entrance way for appropriate proportion. The 2nd floral spray is added the same way, wiring on with the greenery branches. Another Show Me Decorating key ingredient is used, Ribbon! Cuts lengths of each ribbon (approx.1yd) and place a wire in about the middle leaving one side a little longer. Tie a coordinating bow. get the Show Me Decorating app, to learn to tie a bow. Wire on ribbon tails about 1/3 down the teardrop. Wire on the coordinating bow. Add on the 3rd Show me Decorating Key ingredient, balls! 3 gold balls are wired onto the green teardrop base,on the top right, middle and bottom left. 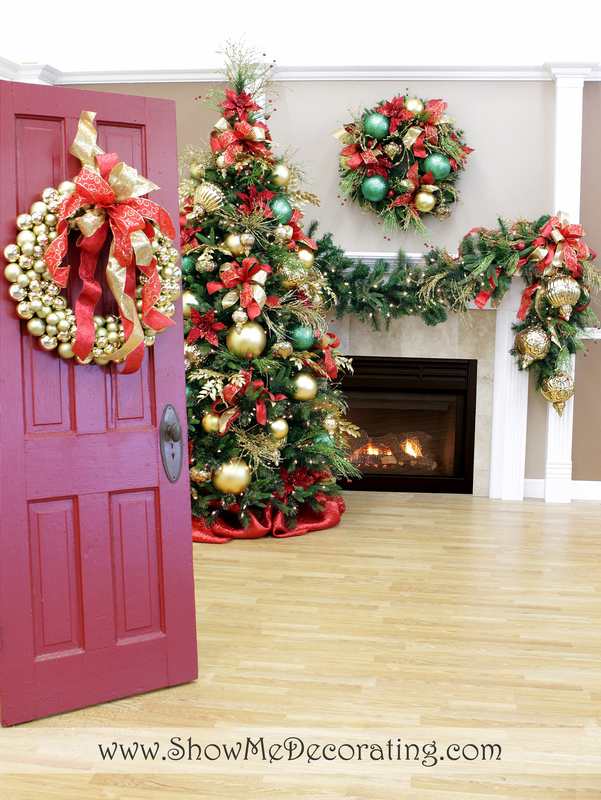 For a quick easy Door Décor, a Gold Ball Wreath and Bow! Wire on a red and gold bow to a Gold ball wreath or choose your own color combination! Christmas Peppermint with a Twist Christmas theme Wreath, fluff a faux green pine wreath, add a fun bow and you are done! 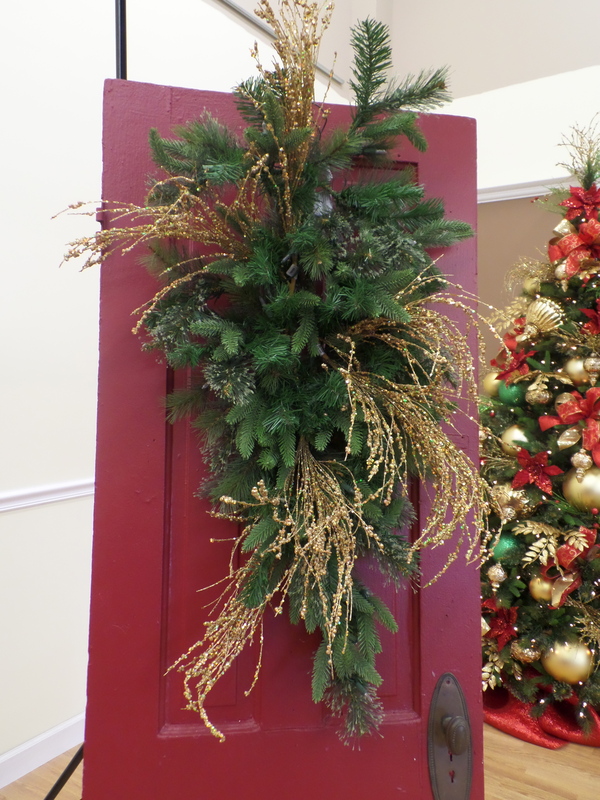 Create a great Holiday 1st impression, starting with easy DIY Door Décor! Show Me a Dressed up Door Decor for New Baby! All-star baby boy is due! 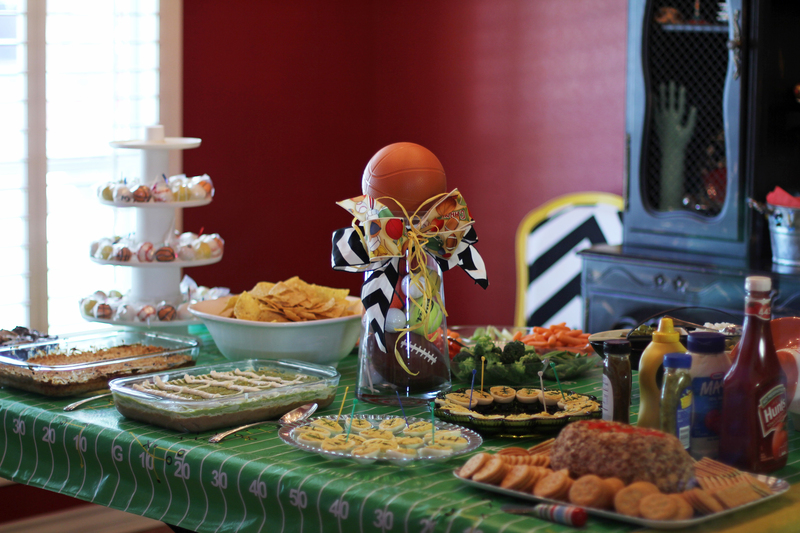 Let’s celebrate with a sports themed couples shower complete with concession stand food! Greet your guest with a home run 1st impression. Dress up your entry door with this cute Glory Haus Baseball Burlee! The large canvas baseball becomes personal when the new babies name is added! Shhhh, it is a secret! The bow topper is as easy as 1,2,3! Glittered red checks on white flocked background is a fun checkerboard of cheer. 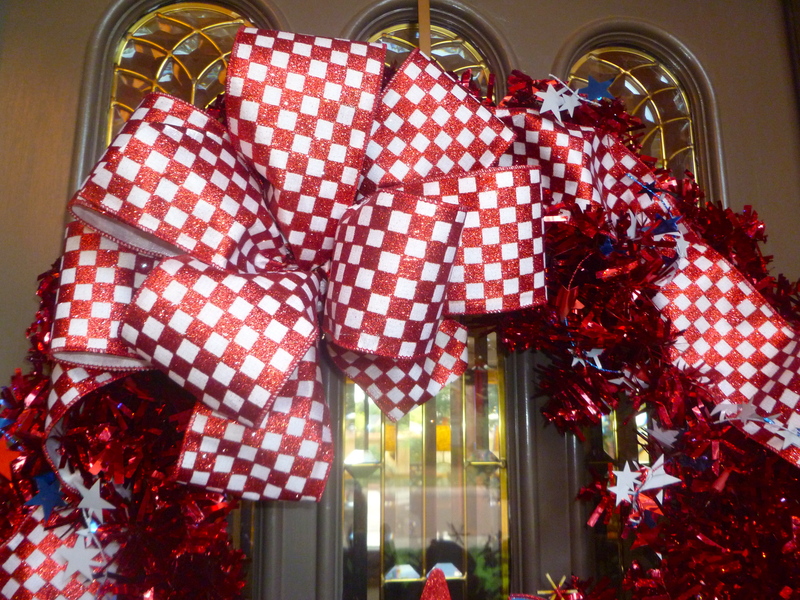 This bow is a triple play, repurpose and reuse for Christmas, Valentines and 4th of July! Game Day Ribbon to celebrate your favorite sport or athlete! Hit it out of the park with this game day ribbon and the black and white (like a referee) chevron! Use the wire that holds sports bow together to attach to the Red Checkered Bow to complete your All-star Bow. Finished bow topper for the Glory Haus baseball burlee Baby boy door decor. Say that fast 3 times! Whew…….. Finished Baseball Burlee hangs on your front door the day of the party. Additional Sports ball Burlee’s are used around the house to continue the theme throughout! The baseball burlee can be personalized with the new baby boy’s name placed on the hospital door, taken home to greet friends and family and help decorate the new nursery! Oh Boy! A little MVP is on his way. Let’s get his parents ready for the big day! Show Me a Baby Shower Fit for an All-star………hang out til after the 7th inning stretch! Great selections of ribbon and door decor! The field is set and we are ready to play! I love summer and I love America. The fact that two of my favorite holidays are close together, Memorial Day and the 4th of July allows for multi use of my collection of patriotic goodies. It is a great time to gather all the Red, White and Blue and start decorating. The front door and porch are the first place to start. 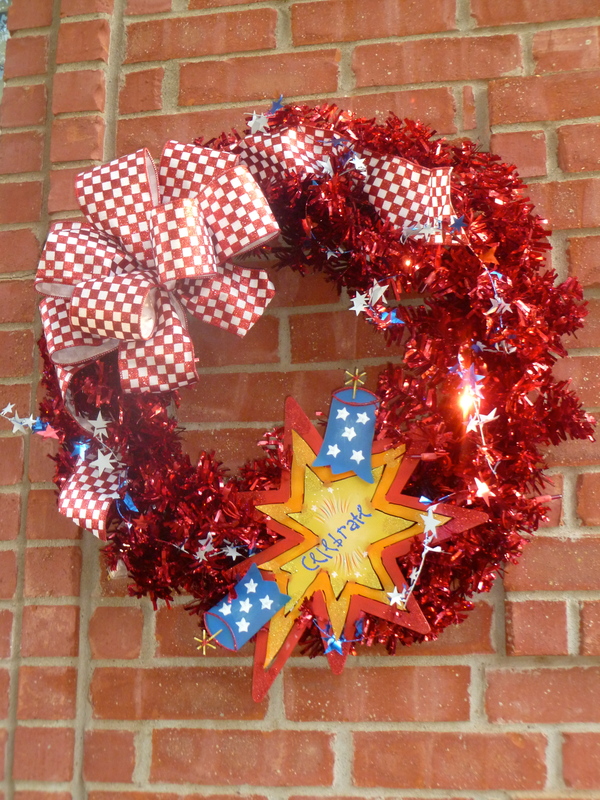 Red Tinsel Wreath with Popping firecracker and big Red Check bow! It is as easy as 1,2,3 4th of July! A great wreath base is key, heavy wire construction and good wired branches allow for using over and over. 3 Key ingredients, wreath base, ribbon and focal point. the back of the Celebrate America with Roundtop Collection’s large Explosion! has a wire loop to attach to the wreath. No glueing allows for items to be repurposed from year to year. Now we are ready to add the bow. Learning how to tie a bow is easy, especially with our fabulous wired ribbon. Our wreath is complete, adding a warm welcome and great 1st impression to the front doorway. It also looks great on the front of the house for all to see! Happy Birthday America and Thank you to all our Brave men and Women who have served and given the ultimate sacrifice for the freedom I enjoy!